Once upon a time, I was a fairly avid Apple user. I had been using Apple products since System 7 and I absolutely adored OS X in all its incarnations with Snow Leopard being the final incarnation I got to use. Now I run Windows 8.1 and my last iPod decided it was time to go missing. As I have no more Apple products I figured it was high time to take iTunes out, behind the shed and give it some lead peace. Now I ask you guys, what is a suitable replacement for iTunes. Obviously, I love my junk to be organized but I also liked the visual flow of iTunes as well. It would also be nice if there was a similar service to Genius. Maybe I could even utilize the auto tagging from vgmdb for once instead of tagging one by one. What do you guys use and why do you like it? I'm an old man, afraid of new things and change. When I first got my iPod, over 10 years ago, I took an immediate dislike to iTunes (still hate it), so I uninstalled it and used Winamp instead. I have never felt the need to "upgrade." For playing music on the computer I use MusicBee. I used Winamp for a long time, but ran into issues with it and had to hunt for a replacement. It took a little bit of minor tweaking to get the look how I wanted it, but MusicBee is better in every way I wanted. For playing music, I use JRiver, which is a high quality program, but is not free. However, for tagging from vgmdb, I use the free foobar2000. The reason for this is that to tag from vgmdb, you need a program which can both use freedb, and can let you point the freedb server settings at vgmdb. I don't know of anything other than foobar2000 which allows both of these. foobar2000 is also a good music player in its own right, and is very customizable, but it will take some work (potentially a lot of work) to get the layout the way you want it. One drawback of foobar2000 is third-party plugins are outdated and are poorly maintained (in my opinion). This is where JRiver wins for me, in that it's all first-party software that's actively being improved. As a sidenote, it's pretty absurd that iTunes doesn't play lossless FLAC files, instead requiring Apple's own lossless codec (AAC). For this reason, I would never consider using iTunes. I have the opposite opinion. JRiver is not high quality at all. It is the MadCatz of audio players. foobar2000 is by far the better audio player and it's components are frequently updated (http://www.foobar2000.org/components). The only drawback to foobar2000 is the amount of time it takes to configure, both preferences and visualizations, to get the player to a state that you're happy with. There are default visualizations, though, which is what I use. It takes a significant amount of actual coding to create your own and it can be somewhat of a pain, but the power is there should you choose to use it. The components and scripting functionality alone make it the best choice for any sort of database or tagging management. I still use iTunes but I have only ever used it to sync files to my iPod -- an iPod Classic for 10 years and then when that finally died, an iPod Touch for the last 2. There is software that emulates iTunes and lets you transfer files to them but I have never been happy with them. I also use the Last.fm Scrobbler to sync my iPod plays to my Last.fm account. That is about all I would ever use iTunes for. I hate the way it presents itself, I hate that it tries to tag/re-tag/move all my files (by default). I hate the way it tries to integrate with Match and Apple Music. It's so annoying that I Just copy complete files to an iPod sync directory in case it tries to do anything with them. I use foobar MassTagger component, + some simple scripts for tagging my VGM. I prefer to curate and carefully tag those so I prefer to do it by hand, especially with the inconsistency of VGMDB entries. I use MusicBrainz Picard for tagging stuff in my iPod sync directory (easy way to get tags + album art) because it's primarily Western music and I don't really care about accuracy all that much. Thanks everybody for your awesome suggestions. I've gotten an opportunity to use all the programs you guys suggested except for the Linux option (since I run Windows) and JRiver. As nice as JRiver looks I think $50 for a license is a little much. Never the less I might be checking that one out in the future if I end up hating everything else. In addition I gave MediaMonkey a try. Didn't care for that one very much. Foobar 2000 was pretty cool, very modular with many features but I was drowning in the amount of pure options. On top of that aesthetically its not incredibly pleasing, but it's very functional. Reminds me very much of Winamp. I finally settled on MusicBee at the moment. Seems like it has pretty active development and a fair amount of plug-ins, skins, bells and whistles. Now the only think I can't figure out at the moment is how to toggle the rip settings of aac. I'm too dense to figure out the command line but I'm not sure at which rate things are gonna rip at. As I understand it qacc is superior to nero but I don't really know how to configure it to give me a 320kbps file. In regards to the vgmdb tagging, it looks like musicbee will let you use freedb and point it to any server that you want so it should work. Edit: On a sidenote, hell with Photobucket. I guess after trying to host an image and getting some bizarre glitch I'm on to the Photobucket alt thread. I use Winamp as a general audio player as well, but I sort all my music on my harddrive rather than any sort of 'media library'. Foobar as noted is fantastic and I use it when Winamp isn't good enough (it's great to make a list of albums, and stuff like that)....and it IS extremely modable so you can get it to look like how you want with a bit of work. I nuked iTunes a long time ago...Sometime after it got super-hard to navigate (2009-ish? It was after the 4th Gen Ipod, but prior to the Classic...I had to sync my mom's Iphone a couple times for her and I was like, "...what the hell did they DO!?"). I'm a Jriver user. Very happy with it and all the tools it has overall. 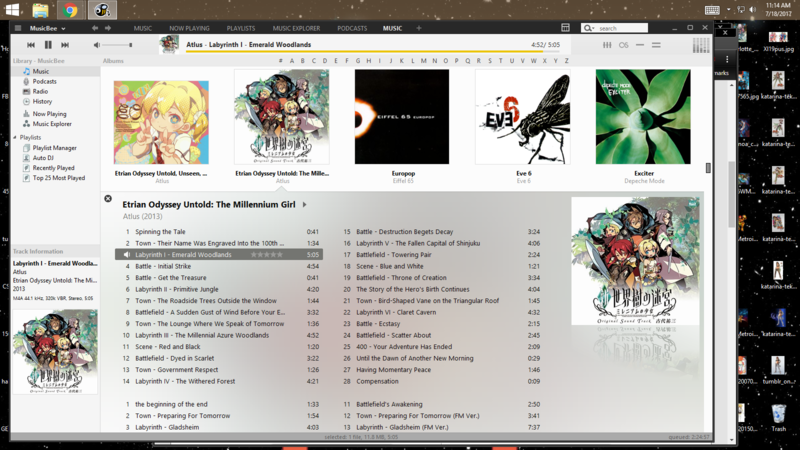 I also have Foobar, but admittedly, I haven't fooled around much with it. I was an avid J River user for many years but had problems with Android sync with my older version and wasn't keen on paying around $30 for every single upgrade, so I've switched to MusicBee as well. There was a short adjustment period and a bit of a learning curve (MusicBee's customization procedures could be more intuitive) but now that that's past I don't find myself missing J River too much, aside from a few very advanced tagging features like search-and-replace. I haven't ripped AAC with MusicBee but I would think you could just copy-and-paste one of the default command line settings in the options and just adjust the number. I imagine Hydrogen Audio has a summary thread with sample configs for AAC somewhere.